Is a Chronic Kidney Disease Diagnosis Considered Disabling? A chronic kidney disease diagnosis is not automatically disabling, nor is it a death sentence. As with most conditions, the severity of your symptoms determines if the condition is disabling or not. Chronic kidney disease occurs when there is an impairment in kidney function. You are born with two kidneys. The kidneys filter waste and excess fluid from the blood stream along with regulating blood pressure. When there is an impairment in kidney function, waste products and fluid can build up in the body. This causes swelling in the ankles, vomiting, weakness, shortness of breath, and poor sleep. Symptoms generally develop slowly, with some people exhibiting no symptoms at all. However, if left untreated, the condition can progress until the kidneys stop working altogether. Chronic kidney disease occurs when the kidneys are not working well for a minimum of three months. Kidney disease is generally treated with medications. The more severe the impairment, the more likely that the treatment may require filtering the blood through dialysis or ultimately a kidney transplant. Chronic kidney disease can be caused by other conditions such as type 1 or 2 diabetes or high blood pressure. There are five stages to chronic kidney disease. A blood test, called eGFR, measures how well the kidneys are filtering waste from the blood. The stage of kidney disease is based upon the eGFR number. Stage 1 kidney disease has mild kidney damage. The eGFR at this stage is greater than 90, with generally no symptoms of disease. Stage 2 is again mild damage to the kidney; however, the eGFR number is between 60 and 89. The kidneys are working well and you may not have any symptoms at this stage. Really, you simply have a test indicating the kidneys are not working, but no real other symptoms. At this stage, you should be treating with a nephrologist who will prescribe medications and monitor the progression of the disease. Stage 3 means moderate damage to the kidneys with an eGFR between 45 and 59. Most people do no exhibit symptoms at this stage. But, if you do have symptoms, they will likely be noted through swelling in the hands and feet, back pain, and disturbances in urination. While you may not exhibit symptoms, you will more than likely develop other health complications as a result of your impaired kidney function. Other complications may include high blood pressure, anemia, and bone disease. Stage 4 means the kidneys are moderately to severely damaged. This stage should be taken very seriously, as it is the last stage before kidney failure. You will want to discuss with your nephrologist the options of a kidney transplant at this point. The eGFR will be between 15 and 30. Symptoms typically become more common and include swelling in the hands and feet, back pain, and problems with urination. The fifth stage is the most severe, as it is the last stage. It is often referred to end stage renal disease. This is when your kidneys have stopped working. The eGFR at this stage is less than 15. Your nephrologist will likely have you on dialysis to clean your blood and will also place you on a transplant list. Suffering from chronic kidney disease is a very serious condition that, if not monitored and treated, could lead to kidney failure ultimately resulting in death. The first two stages are accompanied with mild impairment and likely no symptoms. But if your condition has progressed into the third stage or beyond, your condition is likely severe and you should consider applying for disability benefits. 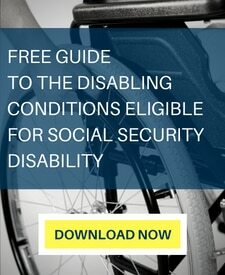 Social Security disability (SSD) is a federal program meant to provide monthly monetary and health benefits for individuals who are suffering from medical conditions impacting their ability to work. If your chronic kidney disease is affecting your ability to work, you should apply for disability benefits sooner than later. When you apply for benefits, the Social Security Administration (SSA) will evaluate your claim using a five-step process. The first step determines whether you are currently working or not. If you are not working, earning an income, you will cruise pass this stage. The second step determines the severity of your condition. If you have been diagnosed with chronic kidney disease but are not exhibiting any symptoms, your claim will likely be denied at Step 2 due to lack of severity. However, if you are exhibiting symptoms that have more than a minimal impact upon your ability to work, you will pass step 2. 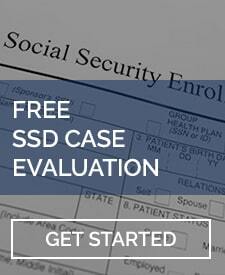 Step 3 determines whether your condition meets one of the SSA’s listed impairments. These impairments are conditions that the SSA has determined to be so severe as to automatically qualify you for disability. In terms of chronic kidney disease, there are three Social Security listings that may be considered. The first listing is 6.03. This listing requires a diagnosis of chronic kidney disease along with chronic hemodialysis or peritoneal dialysis. All this means is that if you are currently on dialysis you will be found disabled under Listing 6.03. The second listing is 6.04. This listing requires a diagnosis of chronic kidney disease along with undergoing a kidney transplant. You will be considered disabled for one year following the transplant. If you are not receiving dialysis and have not undergone a transplant, then the SSA will consider if you meet Listing 6.05. This listing requires showing a serum creatinine of 4mg or greater, or creatinine clearance of 20ml or less, or an eGFR of 20ml or less. You must also show a diagnosis of renal osteodystrophy with severe bone pain, or peripheral neuropathy, or fluid overload syndrome. If you can prove this you will be found disabled using listing 6.05. If your medical records do not support any of these listings, the SSA will then determine what you are physically and mentally capable of. Once they determine your capabilities in spite of your conditions, they will consider whether those limitations preclude you from performing past work along with other work. In terms of a chronic kidney disease diagnosis, it is easier to prove you meet or equal one of the Social Security listings than it is to prove your symptoms cause severe limitations. This is because most of the symptoms related to kidney disease are subjective including fatigue, pain, and weakness. It is easier to prove a test result than to convince someone about your pain level. In either event, along with proving your functional capacity, it is highly advised you obtain representation from an experienced disability attorney who has a thorough knowledge of the Social Security listings.